The price per GB shows a more than 50 fold variation from 3.7 cents to 187 cents. 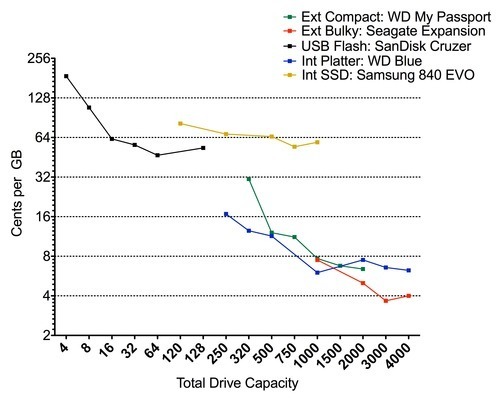 ($0.0367/GB for 3TB Seagate Expansion to $1.8725/GB for a 4GB SanDisk Cruzer flash drive). It is also clear that a larger capacity does not always mean a lower per GB cost, particularly for the largest capacity models. While a low per-GB cost is desirable, the total cost is important as well. 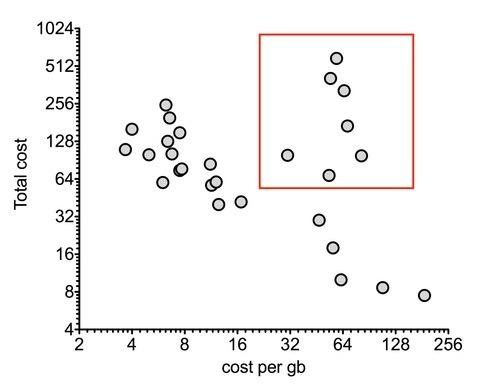 A plot of cost per GB vs total cost shows that there are some particularly undesirable models in there that have both a high per GB cost and a high total cost. These are encircled in red. An important caveat to this analysis is that price variability for the items concerned was not taken into account.